National Science and Media Museum0844 856 3797workGroup VisitsThe National Science and Media Museum is a fabulous free museum in Bradford, West Yorkshire, devoted to film, photography & TV. Journey through popular photography, visit IMAX, the world's most powerful giant screen experience, discover the past, present and future of television in Experience TV, watch your favourite film & TV moments in the BFI Mediatheque, play with light, lenses and colour in the Magic Factory and explore the Animation Gallery. During school holidays there is a packed schedule of free exciting workshops and activities for everyone to get involved in. The Museum is open daily from 10:00am until 6.00pm. 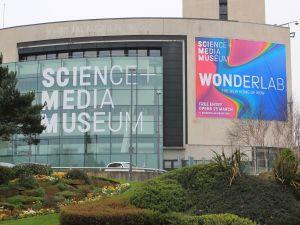 Admission to the National Media Museum is FREE (charges apply for cinemas/IMAX). The National Science and Media Museum is a fabulous free museum in Bradford, West Yorkshire, devoted to film, photography & TV. One mile from end of M606. Come out of Bradford Interchange, turn left at The BradfordHotel, follow signs to museum. The museum is a five minute walk from the Interchange.